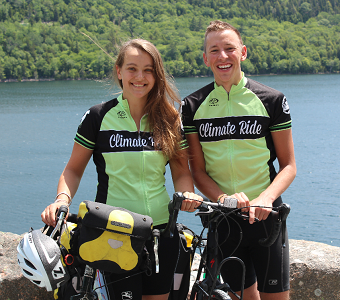 Many students on campus have followed Garrett Blad ’15, who spent the last several months travelling to Paris, mostly by bike, and raising awareness about climate change along the way. His journey was documented on his blog Climate Journey. Garrett is now in Paris as one of 22 Youth Delegates affiliated with SustainUS. The Youth Delegates are live-blogging the negotiations. Joyce Coffee, Managing Director of ND-GAIN, will be travelling to Paris this week to engage negotiators on the need to fund climate adaptation, particularly for less developed countries. ND-GAIN, part of the Climate Change Adaptation program of Notre Dame’s Environmental Change Initiative, is focused on building resilience to climate change. They recently published their annual Index, which rates every country on vulnerability to and readiness to adapt to climate change. ND-GAIN is also for the first time offering a course development grant for new Notre Dame courses that address climate adaptation. Both Garrett and Joyce will be participating via Skype with the December 4th Laudato Lunch, where faculty, staff, students, and clergy will gather to consider the progress of the climate negotiations in the light of Pope Francis’ teachings. This is the last lunch in a series that has spanned the entire semester and explored many facets Laudato Si’ and its relevance for the Notre Dame community. GreeND, Notre Dame’s student environmental club, is planning “COP 21 & Crepes” in collaboration with Cavanaugh Hall. They will be watching live coverage of the negotiations in Paris while making and eating crepes. They are also planning to table in LaFortune and taking pictures for a photo campaign to raise awareness of the negotiations across campus and beyond. Originally published by Rachel Novick at science.nd.edu on December 01, 2015.